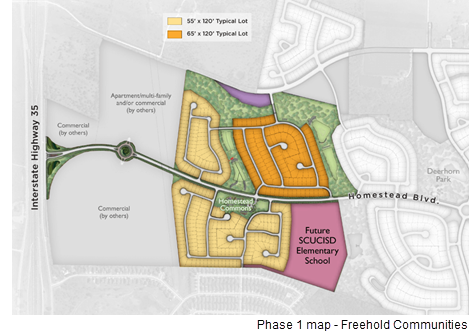 ​​ ​CIBOLO, SCHERTZ – A 552-acre master-planned community with more than 1,330 single-family homes, called Homestead, celebrated its grand opening September 30, 2017. When finished, Homestead will straddle city lines with Schertz and Cibolo, as well as county lines with Comal and Guadalupe County. a 25-acre school site for a new elementary school that will break ground in 2019. Lots will range in width from 55 to 75 feet, with home sizes ranging from 1,500 to 3,200 sf.